On Saturday evening Sevilla welcomed the FC Barcelona at home. Betting sites had a 4+ quote on a win for Sevilla, although the Catalans missed Messi and Busquets. Messi’s role as a central free spirit was expectably not substituted 1-1. Instead, Barca lined up in a rather classical 4-3-3, that could morph into all thinkable sub-structures, which I will not list here. While the pressing was stable, the main problem was the build-up. Rakitic and Paulinho – mostly a bit deeper than Iniesta – often lost contact to the upper midfield as they dropped too deep. So, the full backs played a bigger role in build up which resulted in too many longline passes instead of dominance in the middle. The playmaking weighted on the shoulders of Iniesta, sometimes supported by Suarez who obviously couldn’t replace Messi. Most attacks were fast attacks going through Coutinho or Dembele. This provided some decent chances but also too many losses of the ball. Those two held their sides rather strictly, trying to get into dribbles. However, those weren’t prepared well enough and lacked anschlussoptionen. Sevilla is one of the most promising – mostly uncovered – teams in Europe – with two great midfielders Banega and N’Zonzi in the heart of their game and Johannes Geis in the stands. In their 4-4-2 defensive set-up starting high/semi-high, they were able to defend decently. Most notably were their mechanism on the sides between winger and full back. In the high pressing their wingers sometimes pushed up after switches of play pressuring Barcelona’s center backs. Barcelona’s flat full backs were then pressured by the full-back. In midfieldpressing the wingers behaved rather man-oriented against Barca’s higher fullbacks, sometimes falling back to the last line. However, Barca couldn’t tear gaps strategically. With the ball they showed some eager ball circulation also from the own build up. Barcelona couldn’t build up enough pressure on their center backs in their 4-5-1 structure (sometimes morphed to a wonky 4-4-2 with a 8 pushed forward). They were often able to serve their front 4 who nicely combined with engstellendribbles and short passes, often reaching the box from the half spaces. Here Barcelona sometimes were less resolute in the strafraumverteidigung than usually. No one would deny that Dembele is a great footballer. He proves that in his new team with creative dribbles and passes. However, I would argue, at least up until now he struggles to fully integrate into the Catalan rhythm. He is even less a flügeldribbler coming from the wide wing than Neymar was, still he seems to be provided with that role. I see his main strength in unexpected engstellen in the half space where he reveals unbelievable solutions. He does that through his full ambidexterity and improvidence. He likes to create dynamic with unclear touches and to change direction multiple times sometimes appearing directionless. 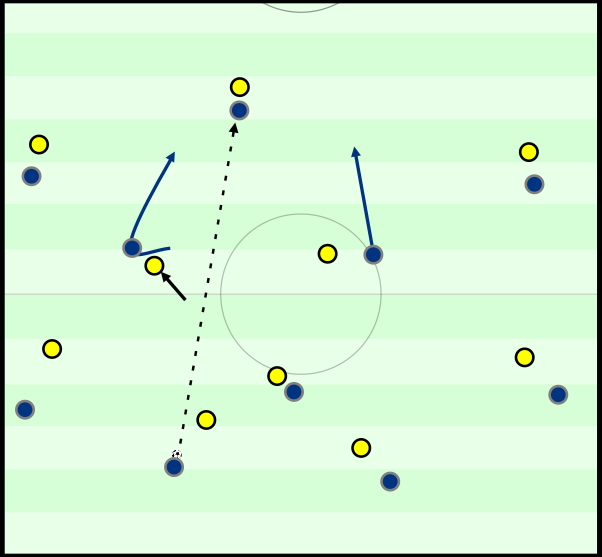 This was embedded perfectly in Dortmund’s fast rhythm with some focus on gegenpressing. In the more composed style of play of Barcelona he seems uncertain when to hold position, circulate or when to take risks. He appears to be very monitored to fulfill guidelines which trims him in his biggest strength. Anyway, he is still crazily young and has enormous potential. When he has internalized some principals of positional play he will have capacity for other problems. If he is able to improve his over-view and decision making as well as his defensive output he might as well explode. Busquets is like the really valuable things in life. You don’t necessarily see the worth directly, but you realize the importance when they are missing. Busquets dictates the rhythm of the game – when to accelerate or when to contain the ball. He is constantly providing options to the back four and thereby secures the ball to reach the middle of the pitch. Additionally, he acts as an anchor to the structure with a godesque intuition where the ball might go. He sometimes prevents counter attacks on his own – in advance, with interception or with tackles. The substitution of Messi changed the rhythm of the game. He was expectably dominant and drove the ball to Sevilla’s backline – sometimes creating chances on his one. Finally, Barcelona reached the Zwischenlinienraum and could place some Schnittstellenpässe that resulted in better chances. Anyway, Messi lost more balls with his dribbles than usually and the change of rhythm did not only result in more chances for Barca but also for Sevilla. Understandably, they took more risk in their positioningwhich lead the restverteidung around Pique, Umtiti and Rakitic to find themselves in equal or even lesser numbers. They often acted too shortsighted and hectic risking slight tackles and others. The lack of Busquets became even clearer in this phase with many chances from counter attacks for Sevilla. Sevilla could have easily scored a third goal through one of those plenty chances but Barca either had luck or defended well in the last moment. So – inevitably – they conceded two goals. Barca is getting more and more and team being built around players instead of for the players. Missing their two most important individuals this team struggles deeply. However most of the blame need to be attributed to the manager and transfers. Valverde has built a successful team probably no one – except feyre – has expected. This game was a nice illustration for the importance and sheer dominance of Messi. He completely changed the game and – though lucky – saved a point. Although being talked about as the weakest team in the remaining 16 in the Champions League, Sevilla is a interesting and strong team – probably better than 17 clubs in the Bundesliga. Let’s see if they can tease the 18. Club.